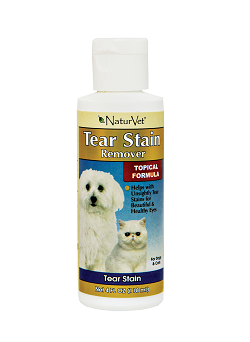 NaturVet Tear Stain Remover is a topical, gentle water-based wiping solution for removing tear and saliva stains from your pet’s fur. Helps remove unsightly stains for beautiful, healthy eyes and coat. NaturVet Tear Stain Remover can be used on dogs and cats over 12 weeks of age. Ingredients: Deionized Water, Disodium Cocoampho Diacetate, Cucumber & Watercress Extract, Aloe Vera Extract and Cetyl Pyridinium Chloride.